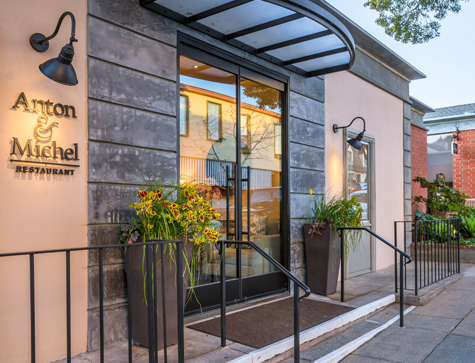 Anton & Michel in downtown Carmel is relaxed and beautiful, with floor-to-ceiling windows, the Court of the Fountains patio, and rose-colored walls adorned with a private art collection. In this romantic old-world setting, waiters take service to the finest level, serving traditional favorites like hand-carved rack of lamb and preparing Caesar salad and flambé desserts tableside. Award-winning wine list features over 400 selections to complement the Creative Continental-California cuisine that lures locals and returning patrons year-round. Established in 1980, Anton & Michel has consistently maintained an award-winning reputation for true excellence in the art of fine dining. Warm pastels, elegant decor, and the sparkling "Court of the Fountains" harmonize to create a serene and romantically intimate retreat. Casual elegance and old world charm coalesce in an epitome of "the Carmel experience". This is a very special place that will garner the top spot on your "must return to" list. Anton & Michel is at Court of the Fountains, Mission Street between Ocean Avenue and Seventh.